How is your weekend going? I just left a fabulous early morning detox yoga class. The best part of the class occurred at the very end when the woman next to me said, “Well that was fabulous. Now I’m ready to go get ‘toxed.’” Ha! We chatted for a bit after class and a Super Bowl party is on her agenda for today! Ryan and I will also be heading to a friend’s house to watch the Puppy Bowl big game and I’m currently making a grocery list so we can arrive with some delicious treats to share! I know a bunch of you out there are likely gearing up for a party today as well and are planning to make a trip to the grocery store this morning, so I wanted to pop in and share some of my go-to lightened up party favorites! Below you will find a mix of side dishes, desserts and dips. Fruit Kebabs with Honey Goat Cheese Dip – This dip requires only two ingredients and is sweet, tangy and creamy. Always a hit! Gluten-Free + Vegan Brownie Batter Truffles – These truffles taste like brownie batter and don’t require any time in the oven. With only four good-for-you ingredients, you can make these in a flash and be out the door in no time at all. 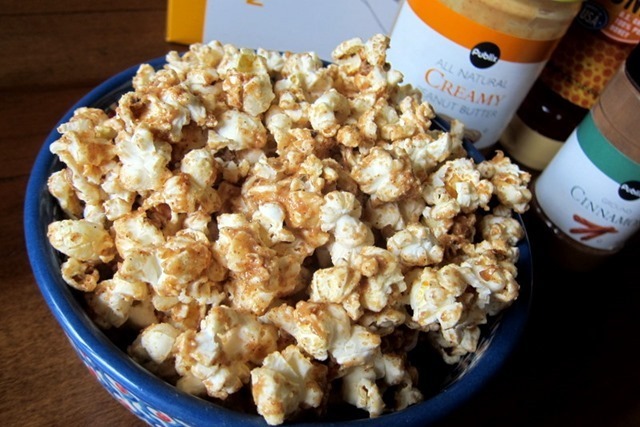 Perfect for the procrastinators out there who also happen to have a sweet tooth! 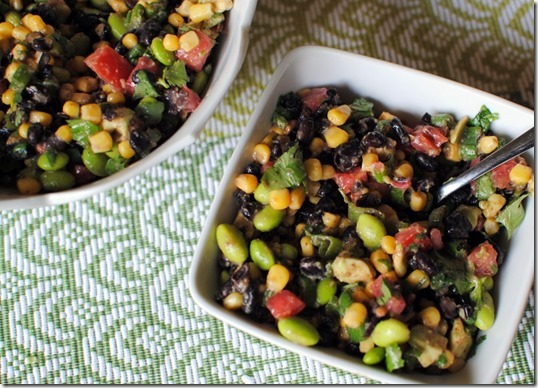 Edamame and Black Bean Salad – This can easily be a side dish or a dip. It is ridiculously delicious and comes together really fast thanks to minimal chopping in the kitchen! 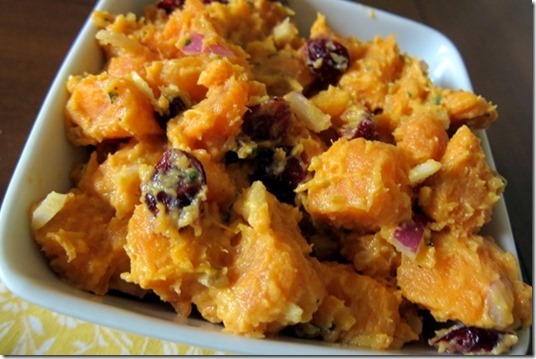 Curried Sweet Potato Salad – As someone who thinks typical potato salad is not so tasty, I was shocked to find myself in love with the curried sweet potato salad dish I had at a local restaurant. This is my recreation of that dish and Ryan and I love the sweet and savory flavor combination. No Bake Oatmeal Nut Butter Balls – A perfectly popable snack sure to satisfy the peanut butter lovers out there! 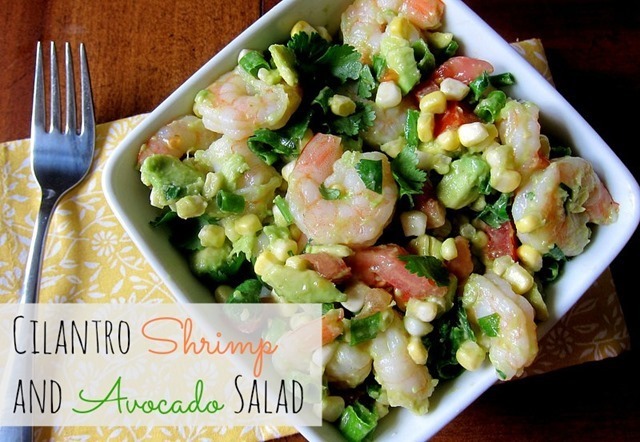 Cilantro Shrimp and Avocado Salad – This salad is light and flavorful and I can easily eat it as an entree, though it makes a fabulous side dish as well. Cinnamon Peanut Butter Popcorn – Combine peanut butter and popcorn and you’ve got a homerun! This addicting recipe can easily be tripled or quadrupled to serve a big group… but don’t assume you’ll have any leftovers! 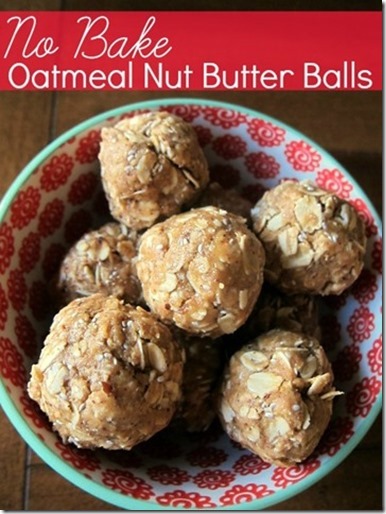 All of these recipes look amazing but I have my eye on the oatmeal-nut butter balls in particular! Thanks for the tips! I make those at least 2x a month! They’re so tasty and a great on-the-go snack! Those nut butter balls look wonderful! I think I will make them for my girls bible study in a few weeks (since I am signed up for dessert). Thanks so much for the inspiration! 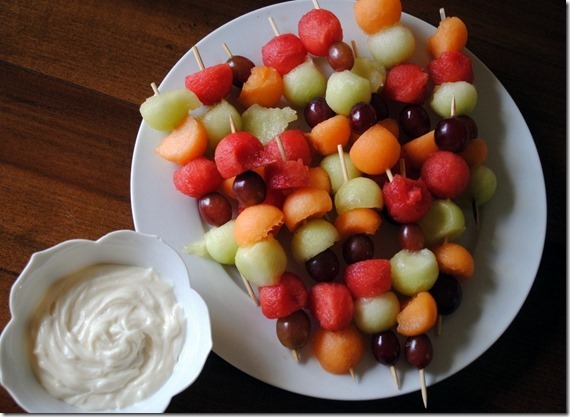 These pictures are making my mouth water! They all look so good! Wow these are some great healthy options! 🙂 Look delicious!! The edamame and black bean salad is soooooo delicious! I’ve made it weekly ever since you first posted it. Huge thank you for sharing that recipe!!! Yum! Adding the edamame black bean salad to my to-make list for sure (not for the Super Bowl though, just for me :)). All the recipes look great! 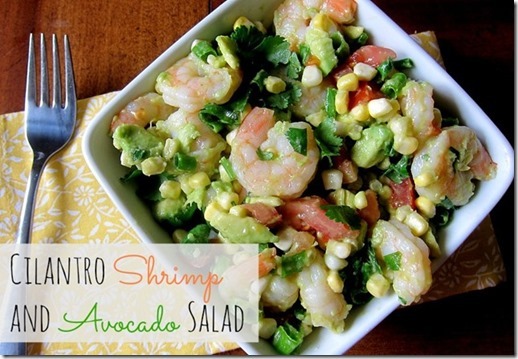 The shrimp&avacado dish looks AMAZING! Will have to try making these recipes! I just can’t get on board with these-one day of regular Super Bowl food is just too awesome to pass up with ‘healthified’ versions! Yum! I’m going to snack on quiche lorraine and veggies & hummus during the game. Go Broncos! 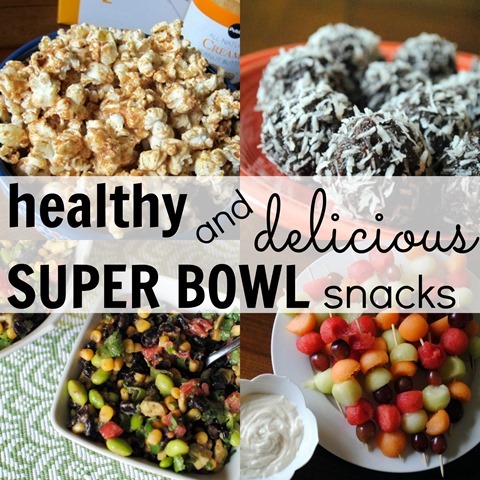 All of your Super Bowl treats look amazing! I’m gonna have to try them. Thanks for giving me more incredible recipes to try! Thanks, as always, for sharing your fabulous ideas! Hope you are enjoying the day and some of these yummy goodies! 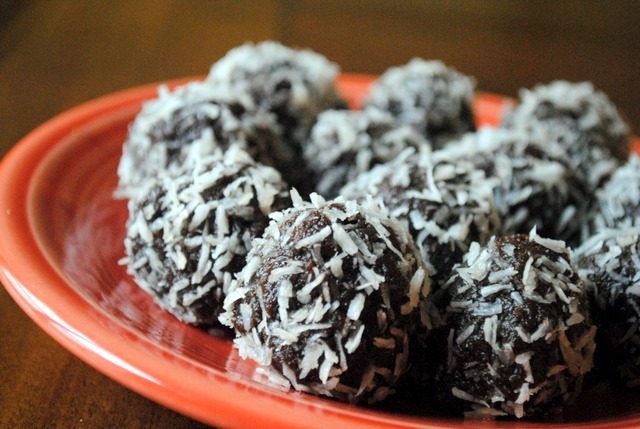 those chocolate balls look too good!! I feel like someone calling into a radio show….long time reader, but first time poster/first time asking a question. I really enjoy reading your blog, and was wondering about how long you spend working on a post? Do you give yourself a time limit? or just wing it? 🙂 Thanks! Those all look amazing! Way better than what I had with the fattening dips, meats, and hot wings. Oh well. I am going to save this so next time I can actually eat something healthy for the superbowl instead of sabotaging myself and eating junk. Great post! Yum! All of these look so, so good!